Please click below for our uniform brochure. 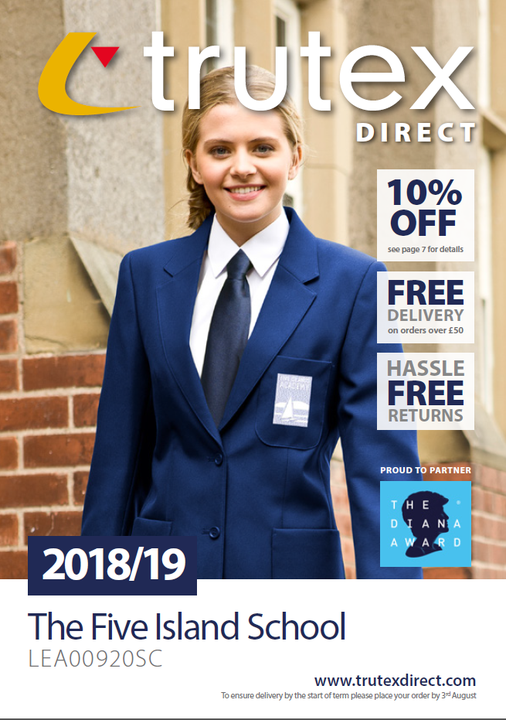 To order school uniform online please visit Trutex Direct (link below) and register using our school’s LEA code: LEA00920SC. Orders can be placed directly with Trutex. Alternatively, you can order from Trutex Direct by phone, call 01200 421206. Postage and packaging is free on orders over £50 or just £3.50 for orders under that amount. Trutex will normally deliver within 7 working days, although during the busiest time towards the start of the academic year this can be extended. Black shoes, black boots or plain black trainers – footwear should be practical and suitable for school activities. Items with a logo can be obtained from here: https://myclothing.com/ - simply type in Five Islands Academy to see options and prices. Following consultation with staff and students a new PE kit was chosen for primary and secondary children. This can now be ordered online from Trutex Direct; see the ordering details above. While we do not expect parents to purchase full kit immediately, we expect all children in secondary to be wearing the new PE kit by July 2019.